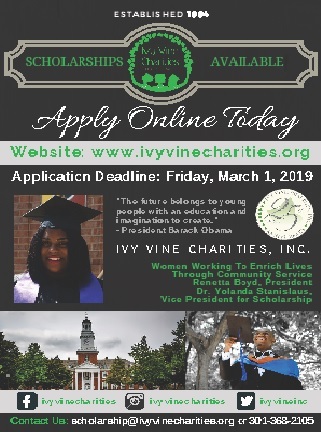 2019 – Ivy Vine Charities Scholarship Application – Ivy Vine Charities, Inc.
Ivy Vine Charities, Incorporated is pleased to announce the availability of our 2019 IVY VINE CHARITIES SCHOLARSHIP APPLICATION. All applications are due by March 1, 2019. Please direct any questions to info@ivyvinecharities.org.